When a builder wishes to construct a skyscraper, would she “wing it,” maybe skip the architect—too expensive—or skip the foundation—no time for that? Not a chance! Likewise, when you’re preparing for the GRE, you must take a well-rounded, balanced approach. What are the foundations for success? Read below for a discussion of each of these components and what you can do to implement them effectively. Give you a snapshot of your performance and your strengths and weaknesses. Provide experience with timing and a “feel” for the endurance required to take the test. Familiarize you with the computer-based interface and section instructions. Allow you to practice using the mouse, keyboard, and scratch paper effectively. Give you problems to review and practice afterwards. This list is by no means exhaustive, but I hope it provides you with a sense of what how significant practice tests are to your GRE success. There are four official practice tests currently available, two PowerPrep Online practice tests and two PowerPrep Plus Online practice tests. All four are available from ETS. The first two are free, and the latter two are $40/each. We do not recommend using third-party practice tests. Stick with the real thing for the best results. Both Text Completion and Sentence Equivalence problems require fluency and command of advanced English vocabulary, best thought of as unspecific academic jargon. Unfortunately, even well-educated English speakers may not be familiar with many of the words that appear on the GRE. Therefore it is essential that students get a head start with vocabulary practice and memorization. 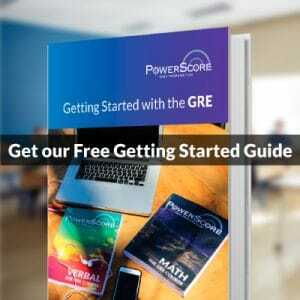 Through our research with all available released GRE material, PowerScore has developed a comprehensive resource not only of the most common vocabulary words but also quizzes to test your progress. Check out our Repeat Offenders Vocabulary Publication. To succeed on GRE Quantitative, you must have a sound grasp of math fundamentals. The GRE covers math skills through Algebra II but not trigonometry. ETS does offer a free GRE Math Review PDF for download. While this document does not offer detailed instruction, it does cover the entire range of math concepts that could appear on the GRE. As with out Repeat Offenders pamphlet, PowerScore has likewise developed Quantitative Reasoning Flash Cards to provide students with a more effective resource to learn the math facts that matter most for the GRE. Before you can learn advanced problem solving skills, you have to have a grounding in these fundamentals, and the Quantitative Reasoning Flash Cards are a great place to start. As you continue your study of vocabulary and math fundamentals, you will want to work in practice with effective test-taking strategies. The GRE is a timed-test, and there is insufficient time to work through all the problems to your satisfaction. Therefore, you need to improve your ability to find efficient ways to answer problems. These strategies are covered in detail in both our Verbal Reasoning and Quantitative Reasoning Bibles. In addition, this blog frequently features posts that discuss essential GRE strategies and skills. We encourage you to subscribe for weekly updates. 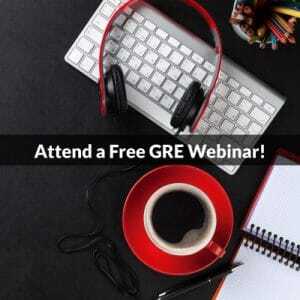 Finally, our free GRE Forums provide you with the ability to ask expert instructors for advice on solving problems or general GRE strategies. No GRE preparation program would be complete without actual practice problems. In fact, practice problems might be the beginning and end of some students preparation. However, it is essential for students to be smart about their approach to problems. First, do targeted problems to reinforce math concepts or test-taking skills you are studying. Challenge yourself to do problems that are outside your comfort zone. It may be frustrating to face problems you have difficulty solving, but the challenge itself forces you to think creatively. This creativity is itself an essential test-taking skill. Second, review your problems thoroughly. As featured in a previous blog post, there are at least two and often three ways to solve every GRE Quant problem. The only way fully to explore different approaches is to attempt the same problems multiple times. Why is this technique so important? When you’re taking your actual GRE, sometimes you may not be able to think of how to solve a problem right away. Instead of feeling stuck or frustrated, in this situation you must be able to shift into an alternative approach. Practicing problems multiple ways increases your skill set, lessening the chances you will find yourself at an impasse. Both Verbal Reasoning Reading Comprehension problems and the Analytical Writing essays require basic proficiency with critical reasoning skills. You must be familiar with the components of argumentation: conclusions, premises, assumptions, informal fallacies such as causal reasoning, logical validity. Further, the GRE will require you to strengthen, weaken, and describe arguments. Some problems require you to make logical inferences. Even problems that do not explicitly deal with argumentation test some of these skills indirectly. PowerScore covers these concepts in our GRE courses and Verbal Reasoning Bible. In addition, we will be offering a free webinar on the Elements of Argumentation on February 7. Register now for free. One perennial recommendation for aspiring writers is both to read a lot and write a lot. For the GRE Analytical Writing Measure, you should embrace this precept wholeheartedly. In addition to the essays included in the practice tests, consider doing timed practice (30 minutes per essay) for both Issue and Argument essays. Fortunately, ETS provides the complete pool of both Issue and Argument topics on its website. Two of these topics will be the topics that appear on your GRE! We encourage you to seek feedback after each essay. On our GRE forums, we offer free advice and feedback on your work. Submit an essay, get advice, then implement this advice on your next practice essays. We hope this overview has given you a sense of what you need to accomplish to achieve the GRE scores you need. Our GRE Free Help Area has much more information at your disposal, including a complete test overview and Self-Study Plan. We also offer online and in-person classes or individual tutoring to match your learning style and schedule.